Contractor is nearing completion of construction stage 2A and is beginning work on Stage 2B. Field activities will consist of construction for portions of the NB on-ramp and SB off-ramp. The 10 day ramp closure is still in effect this week. In addition to that, the NB I-15 will be closed on Friday night from 9pm to 5am along with Limonite Avenue and SB ramps. The SB I-15 will be closed on Saturday night from 9pm to 5am along with Limonite Avenue and NB ramps. The detour for the NB I-15 closure will be to exit at NB I-15 off-ramp and re-enter freeway at NB I-15 on-ramp. The detour for the SB I-15 closure will be to exit at SB I-15 off-ramp and re-enter freeway at SB I-15 on-ramp. Limonite Avenue will be closed Thursday night. Ramp closure detour will use the on- and off-ramps at Cantu-Galleano Ranch Road, and Limonite Avenue closure will use the standard detour along Wineville Avenue, Cantu-Galleano Ranch Road, and Hamner Avenue. Contractor is nearing completion of construction stage 1C and 1D and is beginning work on Stage 2A. Field activities will consist of construction for portions of the NB on-ramp and SB off-ramp. The NB and SB I-15 will have the outer 2 lanes closed on the night of April 2. Limonite Avenue will also be closed while traffic is switched from the north side of Limonite Avenue to the south side of Limonite Avenue. All ramps will also be closed. The closure will begin on the night of April 2 at 8pm and will open at 5am. Closures for the rest of the week can be seen in the 10 Day Ramp Closure notice. The Park and Ride will be closed April 2, 2019 to October 31, 2019. 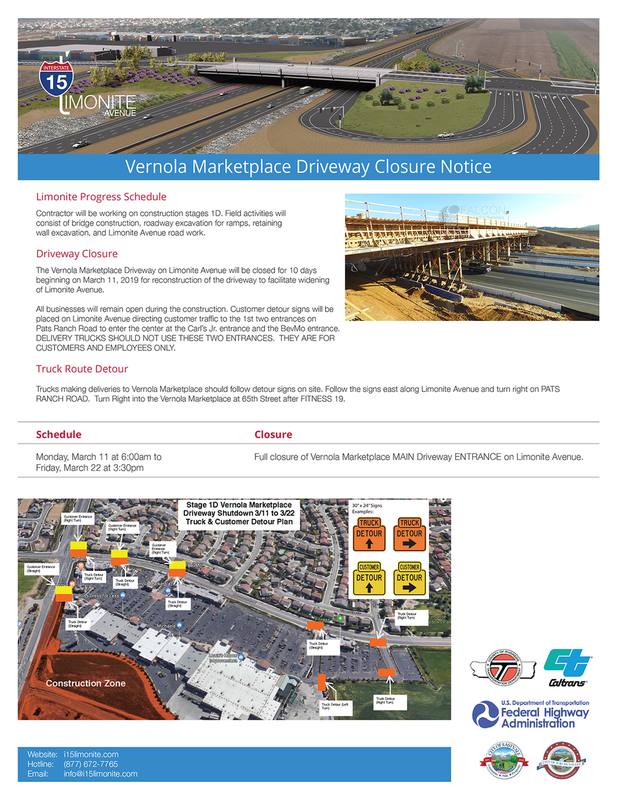 This closure is required to allow construction crews to reconstruct and improve westbound Limonite Avenue, northbound I-15 on-ramp, and Park and Ride facility. Temporary Park and Ride facility will be provided for Park and Ride patrons at the south end of the Vernola Marketplace parking lot past the Fitness 19 building. Signs will be placed directing patrons to the temporary Park and Ride designated area within the Vernola Marketplace Shopping Center. This parking is available Monday at 12:01am to 11:59pm Friday night. Weekend parking is NOT allowed. Park and Ride patrons who do not park in the designated area will be towed at owner’s expense. Vernola Marketplace assumes no liability for theft or damage to vehicles. Contractor nearing completion of construction stage 1C and beginning work on Stage 1D. Field activities will consist of bridge construction, roadway excavation for ramps, retaining wall excavation, and Limonite Avenue road work. 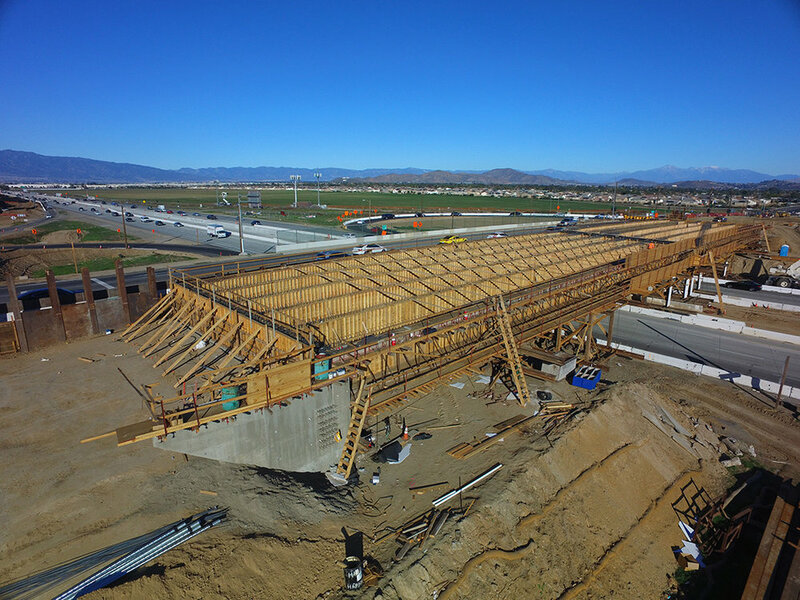 Friday, March 15, CHP will be running 15 minute traffic breaks on the I15 Freeway at Limonite Avenue from 11pm to 5am so that the contractor can remove the temporary wooden supports from the new Limonite Avenue Bridge. The SB on-ramp and Limonite Avenue at the bridge will also be closed during this time. Contractor will be working on construction stage 1C. Field activities will consist of bridge construction, roadway excavation for ramps, retaining wall excavation, and Limonite Avenue road work. Friday, March 8, CHP will be running 15 minute traffic breaks on the I15 Freeway at Limonite Avenue from 11pm to 5am so that the contractor can remove the temporary wooden supports from the new Limonite Avenue Bridge. The SB on-ramp will also be closed during this time. ** The March 8 closure has been moved to Saturday, March 9. ** The March 9 closure has been moved to Thursday, March 14. The I-15 Southbound off-ramp and the I-15 NB on-ramp have been closed due to flooding. The I-15 Southbound on-ramp is beening monitored and will be closed if it becomes a safety concern. More rain is expected throughout the day and continuing through tomorrow, so the ramp closures are likely to continue until Friday or Saturday . The ramps will be reopened as soon as the flooding is subsided and conditions are deemed safe. Full closure of Southbound off-ramp and Northbound on-ramp. Possible full closure of Southbound on-ramp. The contractor’s project schedule has become fluid due to the impacts of inclement weather. The challenge to maintain the committed schedule is because of access to the work area and the availability of contractors to perform portions of the work. Weather impacts and cancellation of work due to weather, creates scheduling conflicts with on-going project commitments and re-scheduling of activities to work-around other project prior commitments. Notices will be provided with the maximum lead time possible to keep the bridge project on schedule and moving forward. Updates will be sent as soon as the contractor work schedule updates become available. The contractor is making every effort to meet the major project milestone by utilizing multiple crews and working nights and weekends when appropriate. We apologize for any inconvenience this may cause. The project webcams are solar powered to be environmentally friendly and conserve energy. When the cloud cover remains for several days, the cameras may lose power and be unavailable until the solar panels recharge the batteries that support the camera system. The website will not be affected by this loss of solar power. Webcam will be available once power is restored. The I-15 Southbound off-ramp has been closed due to flooding. More rain is expected this afternoon, so the ramp closure is likely to continue throughout the night. The ramp will be reopened as soon as the flooding is alleviated. Contractor will be closing ramps and Limonite Avenue Bridge on Tuesday and Thursday, January 15 and 17, 2019. The closures on Thursday January 17, 2019 will only be used if the work is not completed on Tuesday. *Due to rain, this work cancelled for Tuesday, January 15. The contractor is rescheduling this work for Thursday, January 17 or Tuesday, January 22 weather permitting. Contractor will be closing ramps and outside lanes of the I-15 Freeway on Monday and Tuesday, January 7 - 8, 2019.